At Super Products, we are so confident that our equipment will exceed your expectations, that we invite you to schedule an on-site demonstration where we’ll put our units to work for you, in person. We are so confident that our equipment is the solution you are looking for, that we want to take on your worst-case projects – whether it’s vacuuming up raw material spills, cleaning out complex sewer and sanitary lines, or hydro excavating in the harshest of environments. During a Super Products equipment demonstration, you’ll witness first-hand the effectiveness of our truck-mounted vacuum equipment and the various features each unit offers, such as the powerful suction capability of our Supersucker® Industrial Vacuum Loader, to the unique tilt-ejection debris removal system available exclusively on our Camel® Maxxx Sewer & Catch Basin Cleaners, and Mud Dog® Hydro Excavators. In addition to seeing the units perform, you’ll also get a close-up and in-person look at the features that make our products easier to operate and maintain than other units from other brands on the market. In short, you’ll see the features that make our products live up to our name. 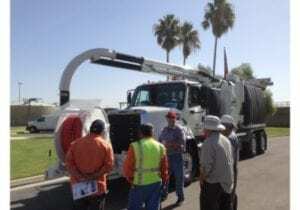 During the product demonstration, we will also provide a thorough and comprehensive description of the cost-saving benefits that can result from using our trucks. Experience the performance and productivity-enhancing capabilities of our products first-hand and contact Super Products today to schedule your product demo!